This is my submission for the LinkedIn Veterans Hackday 2011. CloudSpokes threw in an extra $100 for any member that submitted as an extra incentive. Our members created some pretty cool apps and I'll be highlighting them shortly. 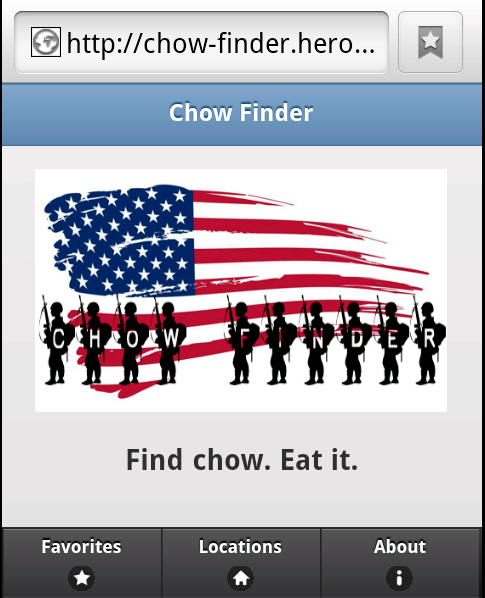 Chow Finder is a mobile application for services members to easily locate dining facilities, aka "chow halls", on any military installation. It was inspired by my sons in the Army and Navy who are always looking for their next meal. The application was written using jQuery Mobile and Ruby on Rails. I used Database.com for the data store and it is hosted on Heroku. All of this for free! You can run the Chow Finder here or fork the code at GitHub. I'm still working on some loose ends.